With the realization of the seriousness of climate change, more and more groups became aware of importance of taking care of nature and our environment.For IT, one of the common environment friendly goal is to save energy on computer systems. Officehackery already discussed some energy saving tool you can use on your personal computers, one is How to set your computer monitor to automatically turn-off when lock down. Another energy-saving tool is Granola. Granola is a free application for Microsoft and Linux that can lower the total system energy use by 10-35% even when a system is 100% utilized. It optimizes your computer system to use energy more efficiently without compromising performance or availability. 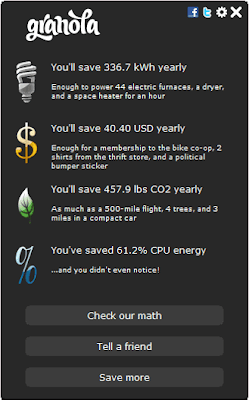 To start saving, just run the app and it will display the percentage of CPU energy saved. It reduces the CPU energy depending on the Settings defined which you can customize by moving the slider from lowest speed up to highest power. On the main form, it shows the vital information, such as number of kWh, money, and CO2, that will be saved annually. Granola works on Windows and Linux.